A good chance to pick up a very decent basic white burgundy at a knockdown price. Very useful Christmas drinking - would work particularly well with Christmas leftovers and smoked salmon. A typically Chilean red - very lush and ripe so possibly not for you if you’re a fan of more classic French styles but a great wine to drink with spicy stews and curries - and even with the turkey. And it’s Fairtrade which is always worth supporting. Bordeaux under a fiver? Yes, hard to believe but it’s true. An attractive young fruity claret that would drink well with cold turkey, ham and other Christmas leftovers. Or with hard British regional cheeses like cheddar. If you don't want to buy six bottles Sainsbury's also has a 'buy 4, save 10%' offer on its range 'in selected stores' (but not locals) which will save you a bit but I'd go for the six if you can run to it. Both offers finish at midnight on November 1st. 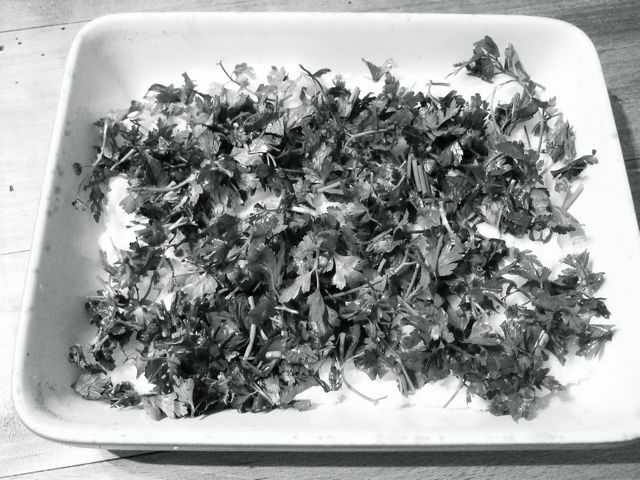 The parsley is a touch I remember from a French cookery writer called Mireille Johnston who presented a BBC series back in the 90s. The books that accompanied the series were great but I left the relevant one in France so had to cook it from memory. 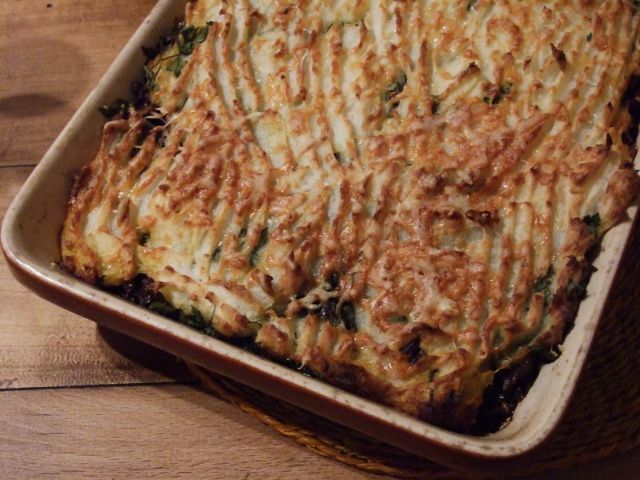 If your kids don't like 'green bits' as many children don't you could cut the amount of parsley back to a single layer or mix it up with the mince so they don't (hopefully) notice, although, of course, the little blighters always do. I can't remember if it had a layer of mash at the bottom of the dish but it's a good idea because you get some delicious stuck on crusty bits at the bottom of the pie. Meanwhile put the potatoes in a saucepan, cover with cold water and bring to the boil. Cook for about 20 minutes until you can stick the point of a knife in them easily. Drain the potatoes, return them to the pan and cut them up roughly with a knife. Mash them thoroughly with a potato masher or fork. Beat in the butter and warm milk. Season with salt and pepper. Moscatel de Valencia, a sweet wine from Southern Spain, has always been good value but it's extraordinary that it still costs only £3.89 a bottle (in most branches of Sainsbury's). A whole bottle, not a half, like most other dessert wines. OK, it's not particularly fashionable but it tastes just gorgeous. It has a deliciously orangey character that would make it a fantastic pairing for apple tart, pie or crumble (served with cream rather than custard), light chocolate desserts (plain rather than with berries) and - thinking ahead to Christmas - Christmas pudding which is always a tricky one to match. You could also partner it with a Spanish style 'flan' or crème caramel. 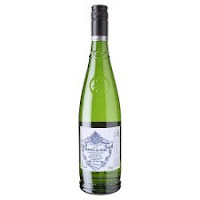 As the name indicates, it's a muscat, fortified with a little spirit to bring it up to 15%. Drink it nice and cold. "These are legendary. 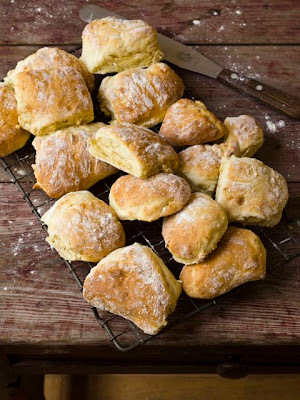 My mother’s mother made them almost daily (bread was a once-a-week delivery in the remote north-west of Scotland) and they were eaten with crowdie, which is a cream cheese that’s sharp and dense. My mother does these too, and they are the talk of the area. And of course it’s the recipe I always use. A few ingredients to get together, sure, but my goodness the results are unbeatable." Have lots of flour on your work surface and empty the mix on to it. Sprinkle on a good layer of flour. Gently roll out into a rough circle about 2cm/¾in thick. Cut up into 16 pieces; some will be square, some will be corners, but they’ll all taste gorgeous. Arrange on the hot baking sheet (no need to grease), spaced a little apart. Put in the oven for about 7-8 minutes until nicely golden. Cool on a wire rack. 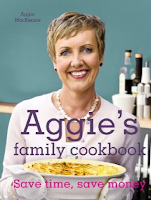 From Aggie's Family Cookbook, published by Pavilion Books, price £20. You may be thinking 'not another celebrity cookbook' and, if so, I don't blame you. If I didn't know Aggie MacKenzie I'd probably be thinking that too. But it may surprise you to learn her background is in food rather than hygiene - I used to work for her on Sainsbury's magazine and Good Housekeeping before she became famous for How Clean is Your House. So the cooking thing is not just made up to trade in on her fame. And this is a real family cookbook. 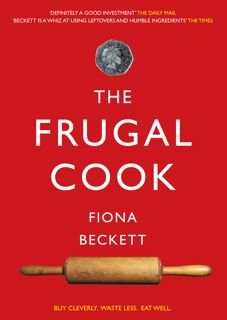 Of things she cooks, her sons cook, her mother cooks and even, her ex and her late mother-in-law cooked (now that is saintly!). It's as if your best friend who's a fantastic cook just handed over all her favourite recipes. There's lots of fun stuff that's suitable for kids too like 'My take on chicken twizzlers' and Clissold Fried Chicken (a Stoke Newington version of KFC) and tips on how to get your kids cooking. The baking section is particularly good - I'll be posting a recipe later this week, hopefully - but love the sound of Tear-and-share Cheesy Rolls, Scottish Morning Rolls and her 'legendary' Granny's Scones. The reason why I'm reviewing it on this blog is that - unusually for a celeb - she keeps the cost of food very much in mind, witness the Baked Chicken Casserole she makes "when I need to see off those lonesome bits at the bottom of the fridge", A Great Veg Dish for Leftover Cheese and Eggy Bread with Fudgey Plums "dead quick when you haven't planned a pud." And there are loads of useful tips on meal planning and saving money when you're food shopping. This is a brilliantly down to earth cookbook that you'll use again and again. You can currently buy it for just over £11 on Amazon but even at the full price of £20 it's well worth the money. One for the Christmas list, defo. I was thinking of making a white wine my wine of the week this week but since the weather has turned chilly and now finally feels like autumn I'm reverting to red again. This time from Asda which seems to permanently have its entire range on special offer. Don't let that encourage you to go mad in the aisles. There's some pretty dreadful stuff on Asda's shelves but here's one that's a fantastic bargain, even at its full price of £4.18. It's a modern Spanish red called Gran Vega Garnacha from Bodegas Borsao in the Campo de Borja region, a big lush, ripe blockbuster of a red that would make great drinking with hearty stews or gutsy plates of sausage and beans. And it's currently reduced (until October 17th) to £3.78 which is ridiculous. Make sure you get the 2010 vintage (it needs to be drunk young) and lay in some for mulling on bonfire night. 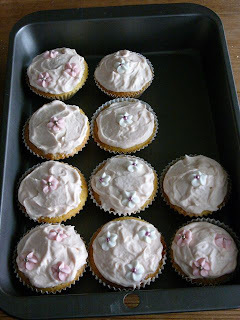 So scornful have I been of the world's obsession with cupcakes I'd conveniently forgotten that I included a recipe for them in my book Food, Wine & Friends back in 2007. And when I was trawling through my photographs just now I didn't think they looked too bad. Even though they were - for heaven's sake - pink. To be frank they're more like a fairy cake - they haven't got the ludicrous amount of icing of today's pumped up specimens but I think they're the better for it. Try them and see. Tip the butter into a large bowl and beat with an electric hand whisk until smooth. Add the sugar about a third at a time and continue to beat until pale yellow and fluffy. Add the beaten eggs and vanilla essence gradually, adding a spoonful of flour with the last few additions. Fold in the remaining flour alternately with the milk taking care not to overmix. Spoon into the paper cases and bake for about 20- 25 minutes until well risen and firm to the touch. Remove the baking trays from the oven for 5 minutes then transfer the cakes to a wire rack to finish cooling. Rinse and dry the beaters then make the icing. Beat the butter until soft. Pour a few drops of pink food colouring onto a teaspoon (easier to control than pouring straight from the bottle) then carefully add to the butter, pouring back any excess into the bottle. Gradually add the sifted icing sugar 2-3 tablespoonfuls at a time. Add the rosewater, salt and enough milk to make a spreadable consistency. Spread on the tops of the cupcakes and decorate with the sugar roses or flowers. Leave for 2 hours before serving. One of the few advantages of being under the weather is that you don't want to go to the shops and make do with whatever you have in the fridge, freezer and cupboard. Hence last night's spaghetti which was also designed to blast through a cold. Heat a frying pan, add the oil and tip in the sliced garlic and chilli. Cook over a very low heat until the garlic begins to change colour. Add the wine if using, reduce by half then add the fish sauce and prawns. Stir and cook over a low heat until the prawns are completely thawed and hot through (about 4-5 minutes) then take off the heat. Meanwhile pour a kettleful of water into a large pan bring to the boil, add salt and cook the spaghetti for the time recommended on the pack. Drain, saving a couple of tablespoons of the cooking water. Put the prawns back on the heat, grate in the ginger and heat through with the reserved pasta water. Season with salt, pepper and a squeeze of lemon juice if you think it needs it. 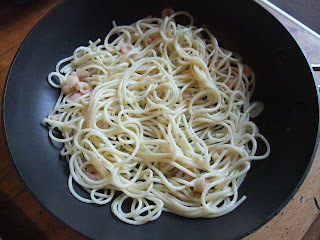 Stir in the coriander if using then tip in the cooked spaghetti and toss together. Serve in warm bowls. If you wanted to do a veggie version you could replace the prawns with broccoli which I'd cut into small florets and stir-fry in the garlicky/chilli-laced oil. * We managed to get 2 reasonably-sized portions out of it plus 1 to warm up for today's lunch. Which is why it's in a frying pan. What's your favourite food when you've got a cold? Unless, like the residents of Stokes Croft in Bristol, you wouldn't be seen dead stepping through the doors of a Tesco supermarket it's the place to be buying wine this weekend. They've got their autumn festival on plus a 25% off offer if you buy any six bottles from them online. I thought we'd left summer behind us but not at all. If you're down by the sea or just eating fish and chips this crisp, fresh-tasting white from the south of France will fit the bill perfectly. Torrontes is a fragrant floral white from Argentina that you'll enjoy if you like riesling and gewurztraminer. Great with mild seafood curries and kormas and spicy Indian nibbles like pakoras. I don't rate the Malbec under the same label as highly, though. Another good red from the Finest range - a delicious smooth, blackcurranty Australian Cabernet. I wouldn't normally advocate buying an inexpensive red as old as this but this should have the concentration to be still drinking well. Perfect for a steak pie. *Note: Tesco now has some 2500 outlets so you won't necessarily find these wines in smaller branches - including ones like my local Metro (unfortunately) and possibly in Scottish branches given the new legislation outlawing wine promotions.